Join Penn’s Village as we learn about our new, very tall neighbor. 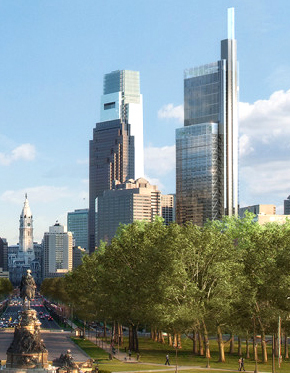 Developed by Liberty Property Trust, the Center, under construction at 1800 Arch Street, will be 60 stories high, the tallest building in Philadelphia and the 8th tallest building in the US. Comcast will occupy the entire office portion and intends to attract the brightest technology minds from around the world. The building will also include a 222-room Four Seasons Hotel, a full service spa, banquet and meeting facilities, and two restaurants, each to be managed by a celebrity chef. The day will begin with a 45-minute overview in the Comcast Center Conference Center, followed by a tour of the construction site. WEAR COMFORTABLE CLOTHES AND SHOES! We will meet at the ground level reception desk of the Comcast Center at 1701 JFK Boulevard. Please register by calling (215) 925-7333 or by sending an email to info@pennsvillage.org. The maximum capacity for this program is 25 people. We ask that you register by March 25. This event is free for Penn’s Village members and volunteers. We would very much appreciate a $5 donation to Penn’s Village from other guests, payable at the event. Our sincere thanks to Jim Lutz and Chris Warth of Liberty Property Trust for orchestrating this unique and exciting experience.